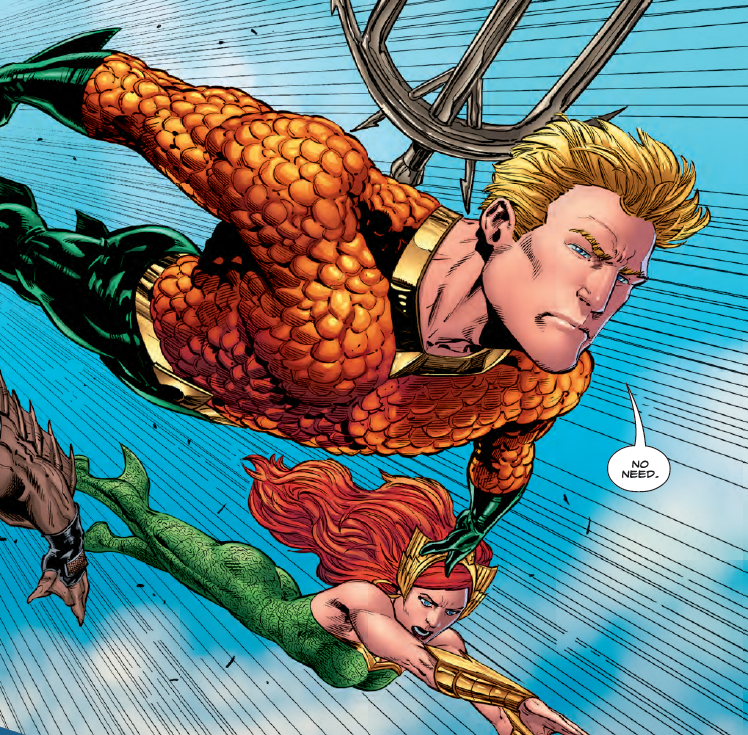 Aquaman #19 Review – AiPT! Deep underwater, no one can hear you scream. Wait, no, sound actually travels quite well underwater. In Aquaman #19, you’ll get some other scientific inaccuracies and some overt allusions (is that an oxymoron?) to a horror classic. Is it good? Times are tough for old Arthur Curry. Not only does he feel the need to team with the Aquamarines, a group that tried to assassinate him and succeeded in killing two other Atlanteans, but his betrothed is giving him guff about it. Honeymoon’s over before the ceremony. Of course Aquaman wouldn’t be doing this if it weren’t for a good reason. A mysterious substance called “strange water” turned someone into a monster called “Deep Water” (apparently under the sea, no one can read a thesaurus), and now an underwater (okay, it is a hard word to avoid) research team has disappeared. When the combined above and below forces investigate, they find something they weren’t expecting, although it’s trite enough a “twist” that they should have seen it coming 200 meters away. Yes, 200 meters, straight to the bottom of that lagoon, even though lagoons are typically less than 20 meters deep! And watch out for those Devonian period animals, which haven’t been seen in a few million years, even though the Devonian ended 360 million years ago! Okay, botched technical definitions aside, Aquaman #19 is an example of why writer Dan Abnett is such a trusted, time-tested hand in comics. As this issue is the beginning of a new arc, the first few pages catch any new readers up on what the sitch is through flashbacks and carefully concealed exposition. We learn the codenames of the Aquamarines before they transform, letting us anticipate what they’ll look like, and finding out why Scavenger’s in that wheelchair sets up where the rest of the story will go. And we’ll get there, eventually! Abnett’s painstaking recap is appreciated, but when almost half the pages of Aquaman #19 contain reminders of what’s already happened, it’s hard not to feel a little short-changed, even at $2.99. When things finally start to move forward, it’s at a slower pace, as the creative team is clearly trying to evoke an Alien-esque horror vibe, something they accomplish reasonably well. The colors by Gabe Eltaeb don’t exactly help that aesthetic, as the brightness on display might fit Abnett’s usual fare, but doesn’t meet the purpose here. Philippe Briones’ pencils are similarly comic book-y, but with some more appropriately stern faces, and the close-ups during the tensest moments are true to the horror genre. Aquaman #19 features an assortment of quality elements that are either individually drawn out or don’t fit together with the greater whole. The overall package is pleasant enough, as with most anything written by Abnett, but the clash of styles and only minor story progression have this issue struggling to keep its head above water. Recap takes up too much space. Get to some new stuff!